ON Palm Sunday, March 17, 1212, the Bishop of Assisi left the altar to present a palm to a noble maiden, eighteen years of age, whom bashfulness had detained in her place. 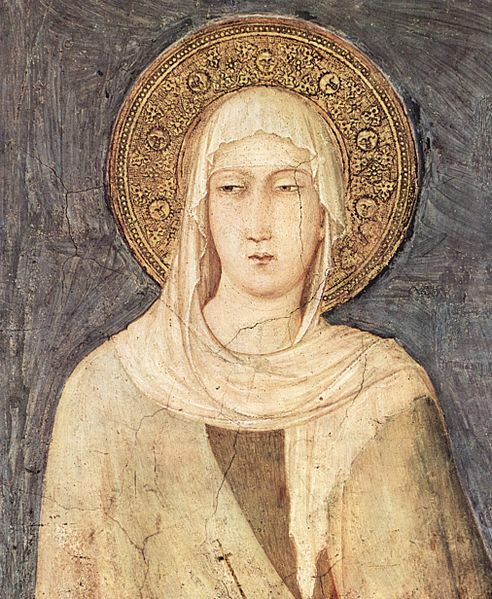 This maiden was St. Clare. Already she had learnt from St. Francis to hate the world, and was secretly resolved to live for God alone. The same night she escaped, with one companion, to the Church of the Portiuncula, where she was met by St. Francis and his brethren. At the altar of Our Lady, St. Francis cut off her hair, clothed her in his habit of penance, a piece of sack-cloth, with his cord as a girdle. Thus she was espoused to Christ. In a miserable house outside Assisi she founded her Order, and was joined by her sister, fourteen years of age, and afterwards by her mother and other noble ladies. They went barefoot, observed perpetual abstinence, constant silence, and perfect poverty. While the Saracen army of Frederick II. was ravaging the valley of Spoleto, a body of infidels advanced to assault St. Clare’s convent, which stood outside Assisi. The Saint caused the Blessed Sacrament to be placed in a monstrance, above the gate of the monastery facing the enemy, and kneeling before it, prayed, “Deliver not to beasts, O Lord, the souls of those who confess to Thee.” A voice from the Host replied, “My protection will never fail you.” A sudden panic seized the infidel host, which took to flight, and the Saint’s convent was spared. During her illness of twenty-eight years the Holy Eucharist was her only support and spinning linen for the altar the one work of her hands. She died in 1253, as the Passion was being read, and Our Lady and the angels conducted her to glory. Reflection.—In a luxurious and effeminate age, the daughters of St. Clare still bear the noble title of poor, and preach by their daily lives the poverty of Jesus Christ.